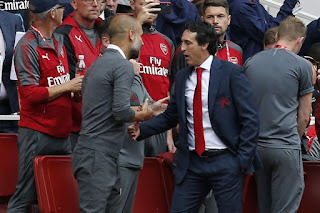 In what was his first competitive game as Arsenal manager, Unai Emery came up with an antic to subdue Manchester City. The Gunners boss, according to reports, was aware of the fact that he was to play against a very strong attacking side, thus the need to come up with something tricky. The former Paris Saint Germain boss who succeeded Arsene Wenger had ensured that the Emirates Stadium pitch was not watered despite the very hot weather. This was contrary to the usual tradition of wetting the pitch to allow for free-flowing play. Unfortunately, the move still did not work in his favour as he saw his side suffer a 2-0 defeat in their opening Premier League fixture of the 2018/19 season. The ploy was noticed by The Blues' head groundsman Lee Jackson who in turn informed manager Pep Guardiola of the cunning act. Jackson said: "After 20 years under the same manager, they [Arsenal] didn't water the pitch before the match or at half time, which is very unusual. It didn't do them any good thankfully. "When Tony Pulis was at Stoke you would walk on the pitch before the game and couldn't see your feet, it was so long. "But most managers now want it wet and short as the ball travels quicker, they tell us. The pitch is where their final work gets done, so if something is not right, we listen to them." Unai Emery has suffered two defeats and won two in the Premier League so far, Hopefully, he will record a third consecutive victory by the time Arsenal visit Newcastle United after the ongoing international break.